Join instructors Lauren and Dean for a day of practical ice training this January. After an introduction to the hazards posed by a frozen lake or river and how to mitigate them, you'll get kitted out in a drysuit, PFD, and all sorts of specialised gear. 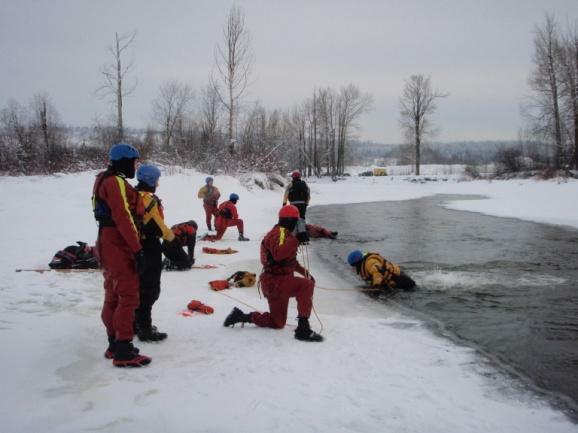 You'll learn about the effects of sudden cold-water immersion, discuss hazard avoidance techniques, then we'll have you practicing a variety of self rescue techniques. Yes, that means you'll be in and out of VERY cold water!! We want to get you thinking about how you can incorporate safer practices into your job or your outdoor recreation. The price is $199 per participant; register by December 31st.